It's not easy being a pear! Pears are in a category all their own. Sweet flavor, tender flesh, smooth skin, grows on a tree. But no they are not an apple. A pear is a quiet fruit. Simple and sophisticated. Not much crunch or acid. But the flavor of a ripe perfect pear is incomparable - deliciously delicate. Pears come in many varieties, but one thing they have in common is super fruit nutrition facts! New Character Announcement: And today is a special day since I will be unveiling a new Lunchbox Bunch character...and he is indeed a pear. I will post him in the next hour! Cyanidin, Caffeic acid and Lutein. Pears are a great source of fiber, vitamins C and K and the important electrolyte potassium. Pears are perfection! Sweet, simple and healthy! 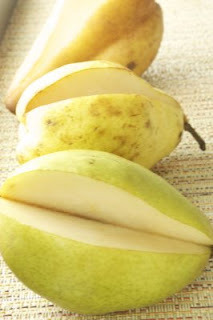 Read more about different types of pears here.